The Poppies went into the match knowing that whatever the results elsewhere they would win the league with a victory. But it was a nightmare start for Kettering as, within three minutes, Alvechurch took a 1-0 lead after a powerful free header from Jamie Willets left Paul White with no chance. The Poppies reacted well, with Aaron O’Connor forcing a low save to Dan Crane’s left before blasting over from six yards, after Crane had palmed away a Declan Towers header. Later in the first half, Alvechurch began creating more chances, with Josh Marsh’s 25-yard shot tipped over by White before a poor clearance from the Kettering goalkeeper was met with a 35-yard lob from Marsh, which bounced and hit the bar before being scrambled away by the Poppies defence. Kettering began the second half brightly, as a free header from Rhys Hoenes was well saved by Crane and cleared off the line early on. And the breakthrough came after 52 minutes when a Poppies corner was cleared only as far as Gary Stohrer, whose cross was bundled over the line by Craig Stanley, making it 1-1. With kick-off having been delayed due to the large crowd in attendance, the Kettering bench knew other full-time scores while having time left in their own match. 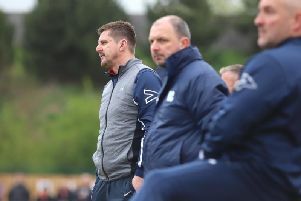 Stourbridge had drawn 0-0 away to Needham Market and King’s Lynn Town had lost 2-0 away to Banbury United, meaning that a draw was now enough for the Poppies to secure the title, and this was reflected with a change in mentality as attack became defence. It may have been this switch in tactics that allowed Alvechurch to capitalise, as in the 88th minute, two of their substitutes Andre Landell and Mitch Botfield combined with the latter finding a yard of space before finishing through White’s legs from fifteen yards with a shot that the goalkeeper would have been disappointed to have not done better with. The Poppies remain in a very strong position, requiring one point from their remaining four games to win the title. 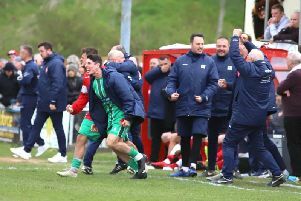 But, for now, their promotion push has been put on hold with the next opportunity to win the championship being away to Halesowen Town next Saturday. Poppies: White; Kelly-Evans, Kelly, Towers, Stanley; Stohrer (sub Solkhon, 74 mins), Richens, Meikle (sub Milnes, 74 mins); O’Connor, Holman, Hoenes. Subs not used: Brighton, Toseland, Rowe-Turner. Alvechurch: Crane; Tonks, Foster (sub Taylor Morrison, 90 mins), Kyle Morrison, Willets; Carter, Bellis, Tyrton, Marsh (sub Botfield, 78 mins); Lloyd, Roberts (sub Landell, 86 mins). Subs not used: Cook, Price. Goals: Willets (2 mins, 0-1), Stanley (52 mins, 1-1), Botfield (88 mins, 1-2). Northants Telegraph man-of-the-match: Craig Stanley – Kettering’s goal scorer has had a big impact since joining the club, and against Alvechurch he had a solid game against a physical and talented attack. Always a great reader of the game, and a calm and collected figure, the centre-back scored his first goal for the Poppies and deserved to be named man of the match.